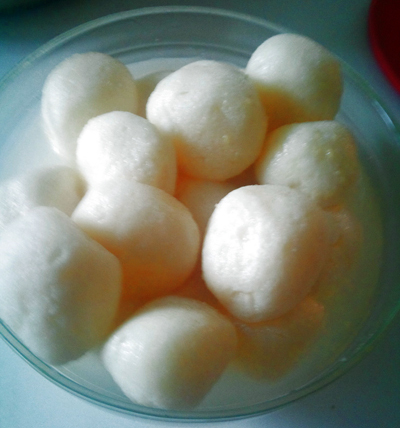 When any Bengali talks about sweet, nothing can beat Rosogolla (My most favourite dessert). In every Bangladeshi occasion this is a must have dessert. For new cooks like me my suggestion don’t stop to make Rosogolla until you reach the perfection. Rosogolla is a Bengali dessert which is soft sweet cheese ball. 3. Now divide the dough into 30 equal parts and make them into smooth balls. Make sure that the pan is large enough to accommodate the puffed rosogollas. Normally it doubles in size after cooking. Very nice work indeed!!! Maximum of us search for recipes but very few make website that help others a lot :). Thanks. Most welcome Salina.I have very easy and handy mawa recipe.was waiting if anyone asks, i will give. keep an eye I will post soon..
You can find self-raising flour in supermarket flour section…otherwise mix baking powder in flour .to convert plain flour into self-raising flour, add two teaspoons of baking powder to each cup of plain flour…but self raising flour is very common thing.. hope it will help..
Hi what is semolina ? I was wondering why we need to add 1/2 cup of water every 10 min is there any reason? Please let me know when you get a chance. to maintain syrup consistency.you are boiling syrup so it evaporates, so need add water keep same consistency of syrup. hope it will help. Thanks for getting back to me so quick.I really appreciate it. Thanks I really appreciate your quick reply. Thanks for every item indeed… can you please send me the recipe of “porabarir chom-chom” of tangail. i try to find our but cant find. keep squeezing water until you can roll cheese in your palms. But dont squeeze too much,then it will become hard rosogolla. Thanks. would u pls tell me how I can make my rosogulla soft??? because my one is alltime hard.pls just tell me. You said to sqeeze the cheese…but in your ingredients you did not mention what kind of cheese and amount we need?? Hi rownak,my rosgolla always becom hard when it becom chill..it soft when it hot. But after few minute later it becom hard. Pls help me I don’t know why its happen. If rosogolla is not cooked inside properly(bitore kacha thakle sokto hoye jay thanda hole), then it gets hard when it cool down. next time cut one rosogolla to check inside cooked or nt before turn off off the heat. Eid mubarrak and Thanks. Tx a lot. I’ll try today hope it ll work. Otherwise I’ll disturb u again. Eid Mubarak to u and u family to. I was searching for answer as to why my rosgulla become hard inside, even why broken, and some more. All answers I got now from your QA session. Thanks a lot. Will try again. My rosogolla was flat, they teste very good, but they became totally flat.what did I do wrong, please advice. Flat!! have you used bit of flour or not? If you have used flour , use bit more flour or use bit less baking powder next. So please enjoy your very good taste round rosogolla next time . Thanks.